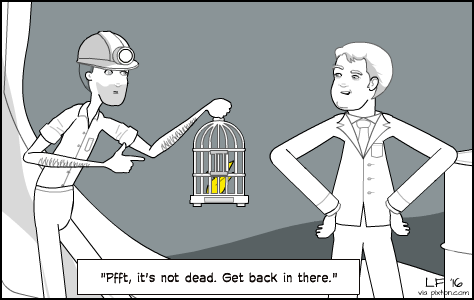 The useful thing about a canary in a coal mine is that it warns you of danger before the danger kills you. The extra-high temperatures and extra-low sea ice with which the Arctic started the year, was just the beginning. 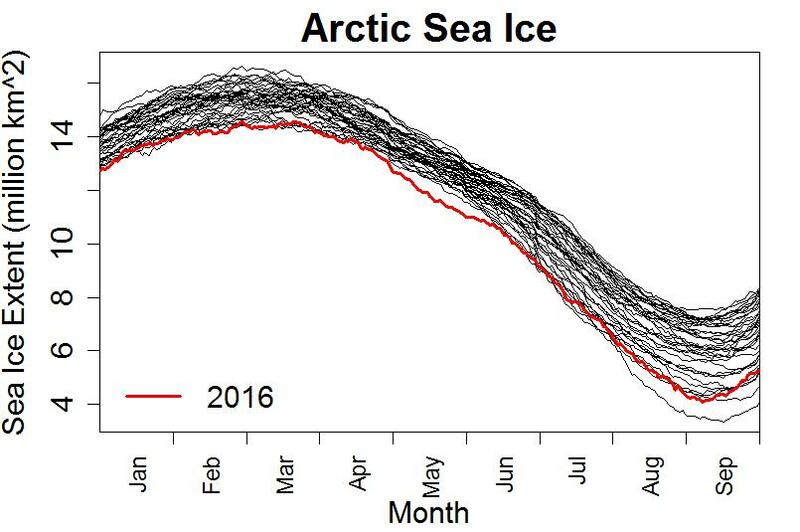 Nobody who knows Arctic sea ice was surprised by this. It has been on the decline, overall, for decades, so it’s no surprise that this year’s levels would be at or near their lowest. 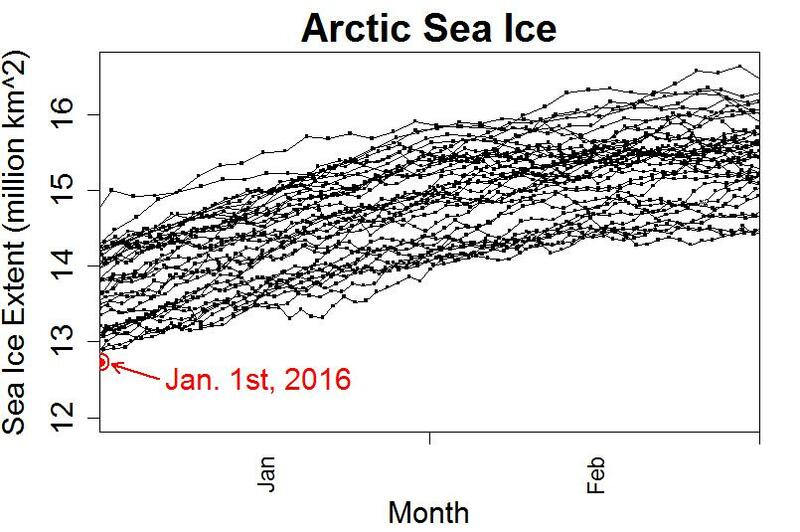 It’s part and parcel of the ongoing trend of the loss of sea ice in the Arctic. Nor was it a surprise that, even with an ongoing trend, it wasn’t always at its lowest-ever. Most everything in nature, including sea ice, doesn’t just follow a trend, it also constantly fluctuates. Added to the overall tendency, there are ups and downs and downs and ups that make it different from day to day, month to month, even year to year. But over the long haul, the fluctuations — even though they never stop — never really get anywhere. What does, what keeps on going and accumulates until we can’t ignore it any more, is the trend — and for sea ice in the Arctic, that means there’s less and less of it. 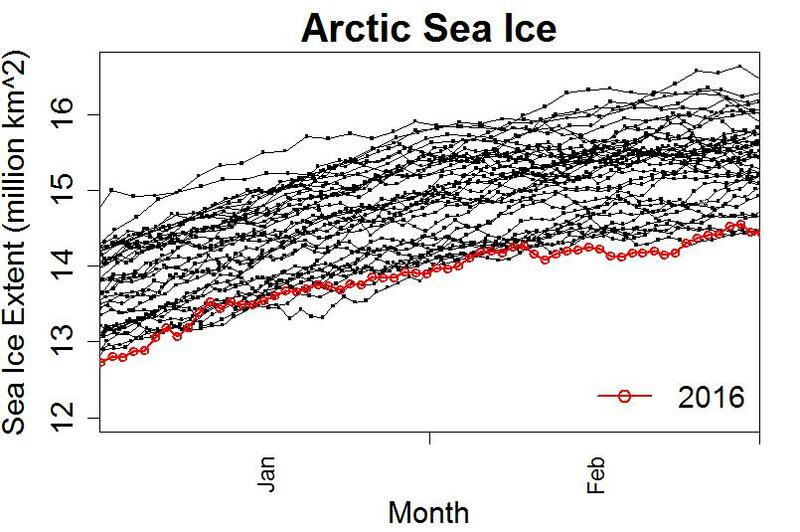 The depths to which the Arctic ice had sunk was, not to put too fine a point on it, alarming. About mid-June it returned to an almost-lowest for-this-date path, and throughout July and August was only 2nd- or 3rd-lowest on record. This was right in line with the ongoing trend of decline, a direct consequence of man-made global warming. After all, the extra-rapid heating of the Arctic and the ongoing loss of sea ice there, had been predicted more than 30 years ago by the same scientists who now tell us climate change is man-made and dangerous. Maybe we should listen. But — to those who deny global warming, who deny that it’s man-made, that it’s dangerous, even deny that it’s real, the fact that Arctic sea ice was only nearly lowest-on-record was enough to call a “recovery.” Some even decided to mention the topic, not its uninterrupted declining trend of course, but implying that because it wasn’t yet all gone, that was some sort of “come-uppance” for scientists saying the reduction was part of a global warming trend. In July, for instance, Christopher Booker, writing in the U.K. Telegraph, told us that “Arctic ice has made fools of all those poor warmists.” “Warmists” is what he calls people who believe man-made climate change is dangerous. He backed up his claim with anecdotes, chosen to make it seem like sea ice isn’t disappearing like most scientists said it would. One thing science has learned, and learned again and again when it’s been neglected, is that anecdotes don’t make reliable evidence. They make great stories, and can sometimes even be persuasive. My grandmother smoked cigarettes and she lived to be 99 years old! They’re also a great way to make a fool of yourself. What made all this particularly absurd was that, despite being led by an Australian scientist, they were so taken in by the make-believe that they seemed quite oblivious to the satellite records showing that Antarctic sea-ice had long been expanding to such record levels that these more than matched any decline in the Arctic ice at the other end of the world. The problem with his only reference to actual scientific data, is that it’s absurdly wrong. 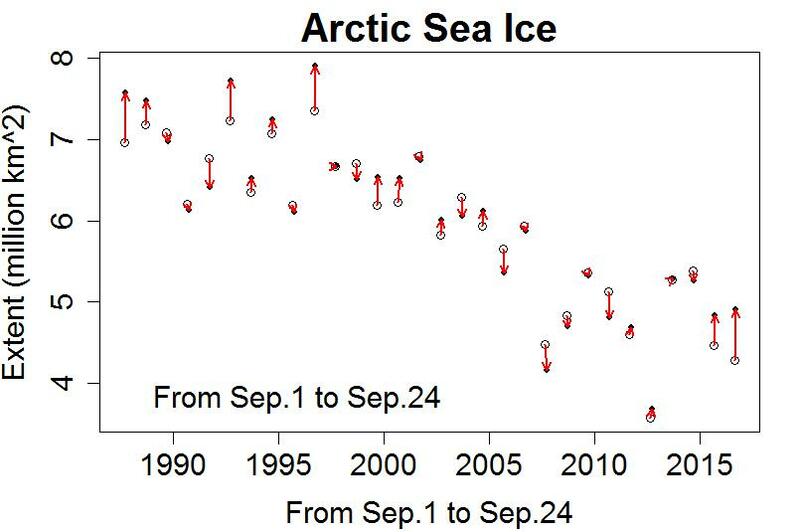 By late September, Arctic sea ice had reached its lowest level for the year (its annual minimum). It wasn’t the lowest on record, it only tied for 2nd-lowest on record. Those in denial looked on this as more evidence that global warming wasn’t happening. This year will have, without doubt, the lowest annual average on record. 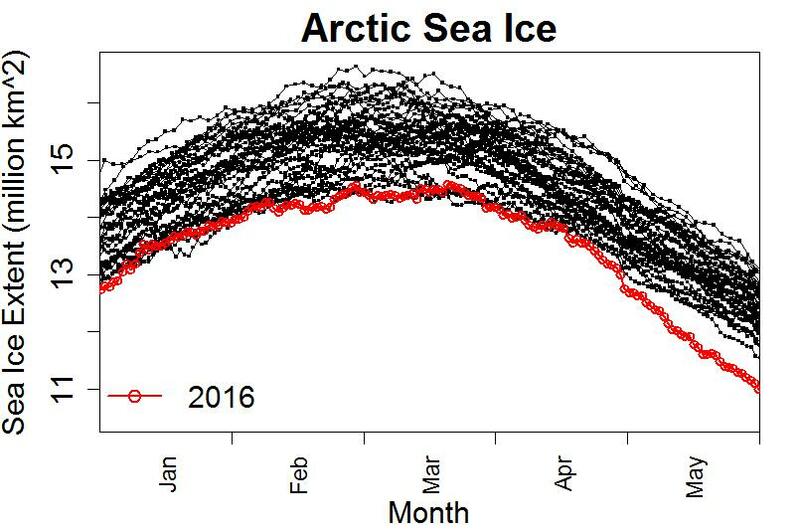 Arctic sea ice has been at record-low values for months now, since mid-October. Of course those in denial don’t want to admit it’s because of global warming, so Anthony Watts decided to blame it on the weather. Perhaps what disappoints them most is that at the south pole, the Antarctic ice which had increased (but not, as they so often dishonestly claim, as much as the Arctic decrease) decided this year to take a nose-dive. 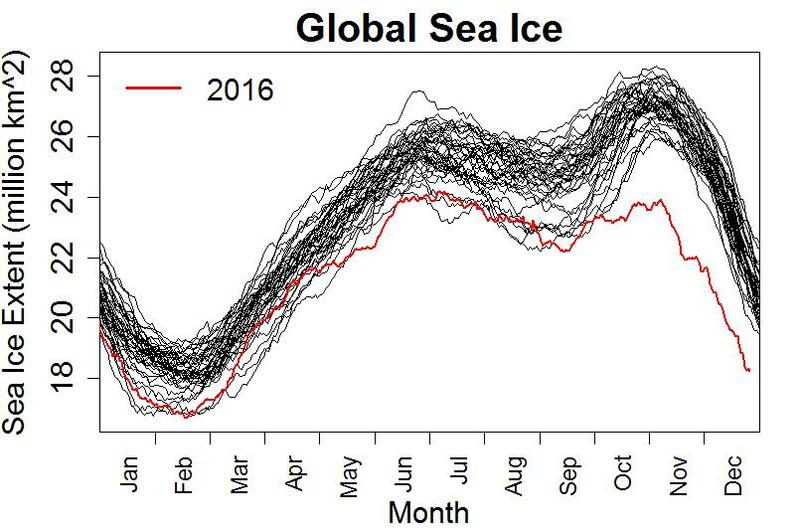 The result is that the global sea ice (north and south combined) is way below what it has ever been. The Arctic truly is the canary in a coal mine when it comes to climate. It was predicted, long ago, to warn us of impending changes. Those changes have come to pass. The canary is seriously ill — if not actually dead. As the year 2016 draws to a close, it’s a sure thing that it’ll end up as the hottest year on record, not just for the Arctic but for the globe as a whole. Not just that, it’ll be the third year in a row to set a new record for global temperature. But climate deniers, like President-elect Trump and most of his advisors, either can’t see that the canary is near death … or they don’t care. I don’t get the “well, the Antarctic sea ice is growing” argument. It’s the other end of the world, the dynamics are not the same and the seasons are reversed. You can’t stop heat loss from your head by wearing extra thick socks or vice versa. In fact, if your feet are cold, assuming you have some thin socks on, the next step is to put on a warmer hat! Or a warmer jacket, or fleece underpants. What sets the temperature of extremities in a homeotherm is its ability to produce and distribute heat; if it can’t keep up with the entire organism’s heat loss, it stops heating the extremities first. Not very similarly: if your polar ice is melting, refrigerate the entire planet — not just the poles. Much of the ice loss is from warming ocean currents. But the planet isn’t a homeotherm. Differentiation or short term “growth” is a well known technique for increasing the noise to signal ratio in information, used not just in global warming denial but also in less-than-completely-honest investment advocacy. I can understand what has happened since October – extra heat in the Arctic Ocean is preventing sea-ice formation. I don’t understand what happened in May. A previous pattern of low variability in extent between years was smashed. What’s that all about? Clouds are a natural suspect. One would have to check the weather. clouds keep the sun’s heat out. Open water in the Beaufort Sea soaking up the sun much earlier than “normal”. But will the 2016 value be individually significantly higher than all other values??? You should know–if you knew ANYTHING about statistics–that there is no significant warming unless each year the new value is above AND outside of the measurement error of all previous values. Tony has told us this before, and he will again I’m sure. 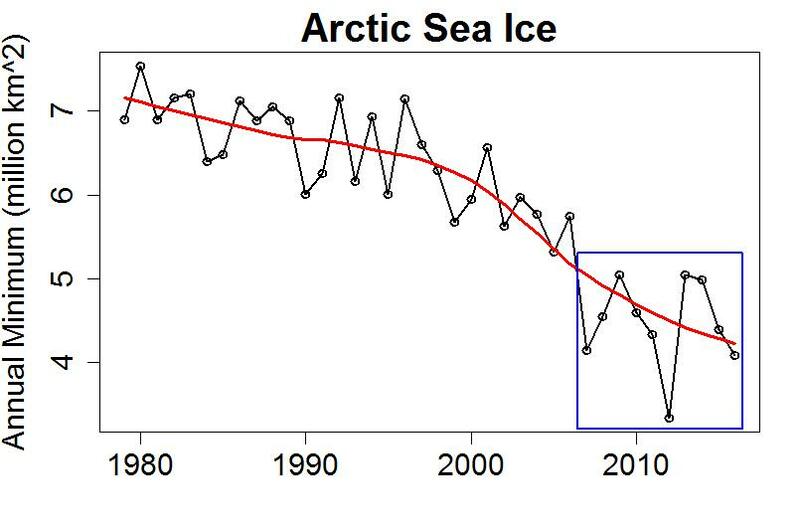 The decline in Arctic sea ice is so stark and obvious that you may find it odd that it is denied with such persistence. But the deniers are merely following Pete’s Rule: when denial gets harder, deniers deny harder. 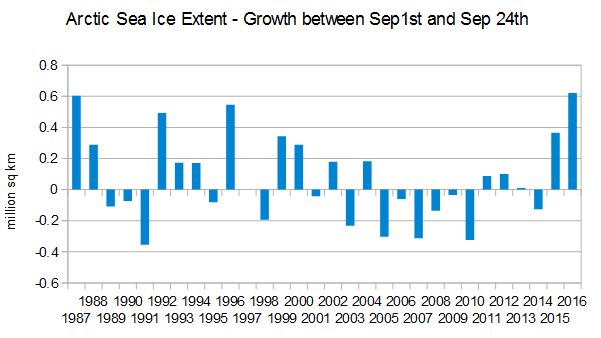 btw does anyone keep count of the number of sea ice decline articles published per month? per year? It must be well ahead of whatever denial topic is in second place. Dr. Mann was right in 2014 when he said we can’t let CO2 rise above 405. Well done, sir. Hammer on the message like there is no tomorrow. That is the ballgame. The area (or extent) of polar sea ice is an important thing, of course, and something that is relatively easy to measure as far as such things go. On the other hand, just last week I read AGW deniers commenting that Arctic and Antarctic ice are at record *highs*. It’s a deeply alien mindset to me; I can’t imagine myself ever arguing that black is white or up is down, regardless of what my motivation might be. @George D and @Pete Dunkelberg, LOL! The movie installments do get progressively more ridiculous, but not yet to a point of absurdity where Bruce Willis fights a worldwide cabal of scientists and foils their conspiracy to shrink sea ice extent. Not only is there less ice area, but the ice is thinner and more fractured. The goal here is not to develop a serious response to the science or anything like a self-consistent viewpoint. All they are trying to do is give denialist nutjobs enough ammo to get through holiday dinners without being utter laughing stocks. If the subject of climate comes up, they merely misquote some random talking point downloaded from the denialist mothership, and that coupled with a nasty attitude will probably be enough to deter further attempts at injecting reality into the dinner conversation. The thing about these folks: they don’t care about the truth. I don’t know if there is non-confrontational way to ask: Do you care about the truth? Does it matter to you if what you say is simply not factual? It usually prompts an angry response where the other party attacks you for something that is not relevant to that question or the facts in dispute – that is clear signal that the problem is ideological. I guess just back off at that point and say, oh, I understand, it does not fit with an important ideology. Ok, carry on. I am pretty sure that will go over fine. Recent study says we need to ask the conservative/deniers “have things changed from the way they used to be? Is our weather, climate, rainfall etc. about the same as it was when our grandparents were our age? I think conservatives resist change but recognize that change is happening. maybe they won’t accept the inevitability of future change based on what we have done, but they might be willing to join and work to restore something that has already been lost. Earth is in orbit around sun, not the other way around. Earth is pretty old, like really old, way more than 10K years. Science – a rational methodology for discovering truths, not a faith system, in fact, a verification system. I think we have to talk with these folks. They wanted their country back and I think they got it. We can dig in and say, hey, “we want our country back” and follow the oppositional bipolar political model or we can try something new. but, hey what do I know? Not much, judging by your comment. Those who voted for Trump were – at the least – ready to vote for an ignorant, racist, misogynist bully and utterly brazen liar and con-artist, with obvious contempt for both ethics and the constitution, and his theocratic sidekick, Trump has proceeded to select AGW denialists, fossil fuel corporate bosses and a parcel of arse-lickers, incompetents and racists as his cabinet and advisers. Resistance, at every level and using every non-violent means is the only moral or rational response. ok, Nick, you are saying: we want our country back! Another 4 years of watching one party do everything it can (which, in this case with a republican president, a republican congress and a right wing judiciary, will be very little) to stop the other party from advancing its agenda. I understand the attraction of bitterness, hostility, anger as a response to right wing success, I just think that “beatings will continue until morale improves” approach has proven to be a dead end time after time. Is that the best idea/suggestion you have? Is that all you got? I think the social science on this election is not settled. I think the reasons why so many people were willing to vote for this guy should be reviewed carefully. I believe a lot of folks voted against Hillary. I think we should speak respectfully to our family, friends and neighbors and we should be strategic about the level and focus of our chats. But hey, if you have enjoyed the culture wars so far and want to regroup to see if we can turn this thing around, fire the cannons, Beauregard. There can be no basis for conversation unless both sides accept that there are facts and they are to be accepted. About 30% of Americans reject the very existence of facts at the present time. Even if we can keep Trump from nuking the planet or wrecking the climate, after 4 years, we will still have these idiots for whom the truth is irrelevant. I see not way forward unless the electorate gets a whole helluva lot smarter. 53% of the voting electorate constitutes a landslide. I think that 27% of the electorate cannot be reached because of ideology. That is the approval group of GW Bush at the lowest point. These folks cannot stop us if we can get 53% of voting electorate to act. But, I could be wrong about that. I’m not saying “we want our country back” For one thing, I’m not an American. More important, I’m saying racism, misogyny, irrationalism, fascism and lies must be resisted, not excused and apologised for. agreed with regard to confronting and resisting the racism, misogyn and fascism. I spoke too broadly above. Some of these folks cannot be reached or reasoned with. They are probably 24-27% of the electorate, which is shockingly high, who may be simply dangerous ideologues, the lunatic fringe. Thanks to the second amendment stupidity, these folks are not only crazy, they are well-armed. The US just gushes arms and weapons into the world. That is nuts, but has been impossible to address/manage thus far. 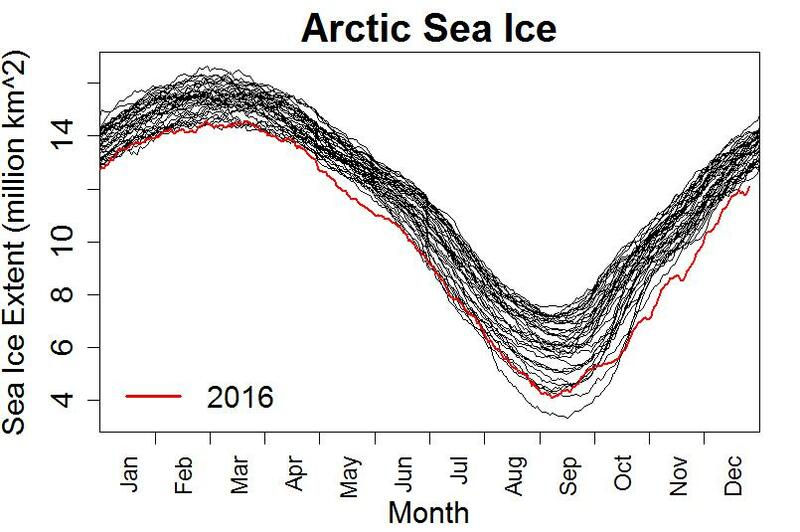 Re-blogged this over on the Arctic Sea Ice Blog. Thanks, Tamino. I think conservatives resist change but recognize that change is happening. Conservatives resist change in human social practice and change in nature is outside that issue. This is a dichotomy that some people have trouble recognising. I think the social science suggests that conservatives recognize that the environment has degraded, so talking to them about the good old days reaches them. The world we have now is not the world that our grandparents were born in. Conservatives get that. Then the question is whether they can be persuaded to take any steps to move back toward the more stable world of past generations. Talking to conservatives about how much the world is going to heat up and what that means does not reach them. We need to be strategic in our struggle to reduce the speed and impact of the sixth great extinction event. That’s all future stuff, we get it, conservatives do not work that way. Talk about how much better things used to be and you reach them. Or scream at them for being stupid and voting for Trump. That’s more fun and less work. I can provide counter examples. There are some conservatives who deny that sea level has risen and, as we all know, deny that global warming hasn’t happened/is much less than it actually is. You will need to come up with a citation for your claim that “social science suggests…” before I accept it. And then there are the issues with getting conservatives to act on that claim. from ThinkProgress, Dec 13th: Have we been talking about climate change all wrong? Look back, not forward, to connect with conservatives on climate, new study suggests. I have posted this numerous times. It looks persuasive to me. If this study is correct, the whole frame of talking about degrees of temperature rise in the future does not speak to conservatives like it does to so many others. If this research is correct and you reflect on how climate change impact has been so heavily presented with regard to future impact, then you may wonder how much more effective we might have been with a more balanced presentation; one that talks about what has already been lost or changed as the first frame of the discussion, then continues to future impacts. Think about it: we want our country back! where have all our jobs gone? A lot of this stuff is presented and experienced by conservatives in exactly the frame that this social science study suggests that conservatives think in. fight the smart fight. Or maybe you can find citations to studies that indicate Matthew Baldwin has this wrong? We like science, right? But, hey, what do I know? I just keep reading the studies and attempting to connect the dots. That’s simply a false claim. It may be that large hurricanes happened less frequently in the past but that certainly doesn’t mean they did not happen. You might be different but I’m certainly not persuaded by false claims. You are under no obligation to accept peer-reviewed science if it does not fit with your ideology or conflicts with important decisions that you are strongly committed to. Thank you for your (somewhat offensive) straw man argument. My comment had absolutely nothing to do with ideology. It was simply a statement of fact (that large hurricanes have happened in the past, contradicting the false claim in your citation). If anything, I’d say that the person that is persuaded by an article with factually erroneous claims is the one who is trying to put forward an ideology but hey, what would I know, I’m only a little person who cares about facts and is considered an ideologist for caring about facts. Obviously facts no longer have any significance and can safely be ignored and simply replaced with straw man arguments. Pity you think it’s someone else’s job to find that out. I’ve already done enough work for you for one day. First, the people who are really the problem are not conservatives any more than Ayn Rand was a conservative. They are as radical as the most fervent communist. Or they are Xtian dominionists. They will not stop until society is totally reconfigured in their image. And the body count required to get there does not concern them. You cannot reason with these people. And then there are the hucksters, like Drumpf who merely smell gullibility and want to figure out a way to cash in on it. agree, snarkrates. These folks cannot be reached or reasoned with. It’s a waste of time and effort. It is everyone else that needs to be pulled into action. The dominionists, the randians, etc are just a relatively large lunatic fringe that we have to work around. 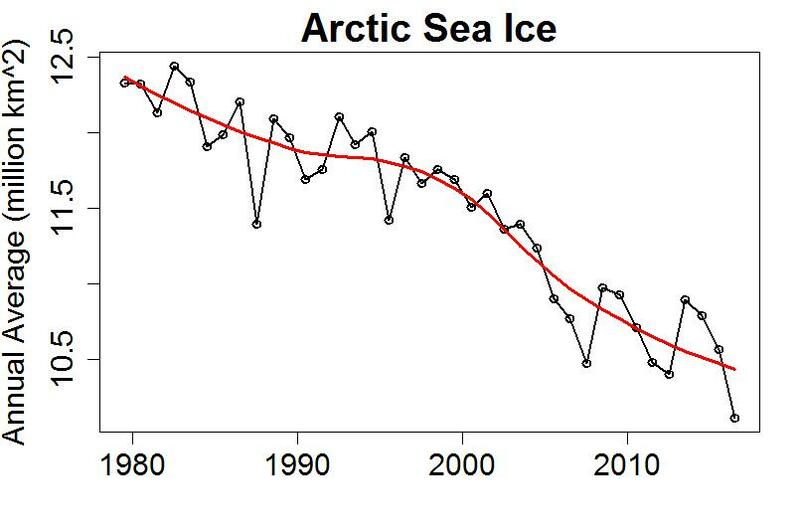 When discussing the Arctic elsewhere I am presented with this graph of Hadcrut4 70-90N. 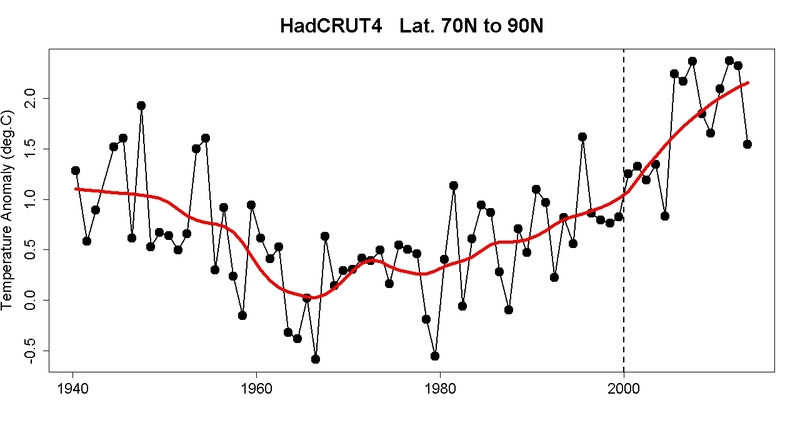 NOAA and NASA Arctic temperature are similar to Tamino’s Hadcrut4. The first graph’s website only shows Hadcrut4 data which I find for a lay person difficult to obtain, which may explain it’s use. What’s your problem? Align them appropriately from 1940 on and they align well. Note that one graph begins in 1900 and the other in 1940. Now look again and see if there’s much difference. If you have the skill, overlay the images matching the units on the axes and see how different they look then. By my eyeball, they look very similar from 1940 on. So they appear quite different. The acronym MAAT used on the Climate4You graph is Mean Annual surface Air Temperature but what they present is no such thing. The deluded folk at Climate4You rather let the cat out of the bag on where they are coming from by mentioning their use of a latitudinal correction which Gillet et al (2008) are accused of not making. Bad Gillet et al!!! But if you have a read of Gillet et al (2008) (PDF here) you spot two things (additional to the reason why they do not make the correction). Firstly, Fig 1 shows the Arctic average temperatures rising steeply with 5-year mean anomalies approaching 2ºC even by 2008. This is a whole different graph to the Crimate4You annual version. Secondly, Fig 2a shows that Gillet et al (2008) analyse temperatures down to 65ºN rather than stop at 70ºN. Indeed, most of their temperature coverage is 65-70ºN. The small amout above 70ºN comprises just 10 grid squares filled in. And the majority are coloured as having a negative temperature trend. Ouch! 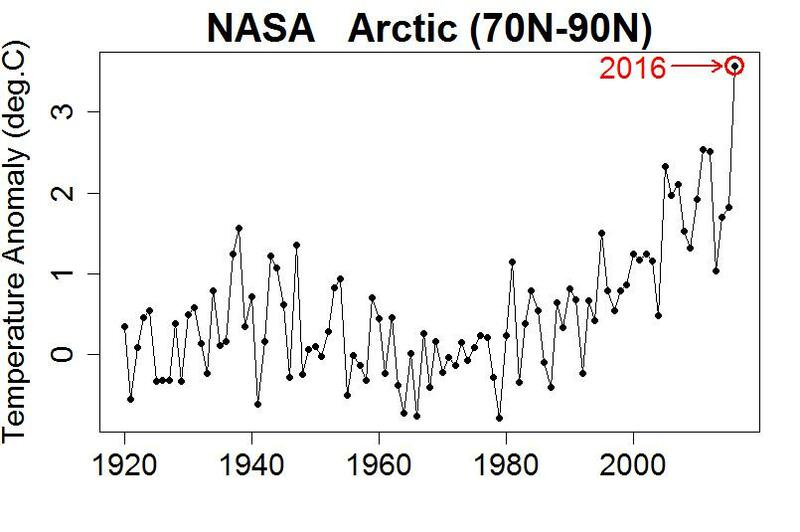 I can imagine the deniaists’ glee at spotting those negative trends and setting-too with an analysis to disprove Arctic temperature rises. What fun!!! The latitudinal correction actually makes damn-all difference. What does make a serious difference is the foolishness of the Crime4You crew. If you take all the HadCRUT4 anomalies above 70ºN and average them out by area of square to account for latitude, you will (I assume) get the graph presented by Crime4You. But this would not be a plot of air temperature as the majority of the data is SST data and also it hides a fatal flaw. What the motley crew at Crime4You have failed to account for is the melting Arctic. With passing time, the proportion of SST in the +70ºN annual data has expanded as average annual Sea Ice reduces in area. As a result, the average for years back in the 1940s would have been mostly land data, the MAAT (as Crime4You call it). These land temperatures have warmed dramatically. 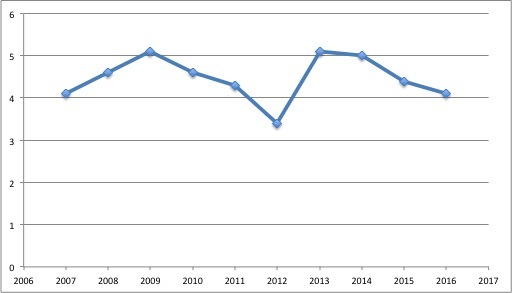 The +70ºN land anomaly (ie CRUTEM4) for 2015 averages to +2.6ºC, way off the Crime4You graph. If accounted properly, the SST anomaly will also have risen dramatically. But if you ignore the difference between the two, the increasing proportion of high Arctic Ocean SST depresses the average HadCRUT4 anomaly for the region and (presumably) yields something not a million miles away from the rolling annual averages graphed by Criminals4You. The +70ºN unajusted all-anomaly HadCRUT4 average for 2015 works out to +1.6ºC, a little above the graphed value. So in conclusion it is a fake graph produced by fools and liars. Thank you for the detailed answer and links Al Rodger that helps a lot,missed the comment by PaulS,agree JCH they are quite different in the latter years. As I alluded above, if you align the 2 graphs properly, they align well. The fact of a few values differing only indicates they are NOT the same (processed) datasets. If anyone can point to the actual data vectors I would be extremely surprised if the TREND estimates would vary much at all. Yes, individual data points need to be haggled over until they are the best possible product, but the existence of these 2 graphs speaks nearly nothing at all to the trend issue. Next we’ll likely be hearing that since 2016 was not significantly uniquely higher from all preceding years given measurement error, no warming has occurred. Next = right after the summary reports come out. The fallacy of the beard: If a person has no beard, one more day of growth will not cause them to have a beard. Therefore Fred can never grow a beard. In the global warming context, a year of insignificant global warming will not cause there to be global warming. Therefore there can never be global warming. Sorry, Tamino – getting very tired of the ‘canary in the coal mine’ – I think there must be more than 50,000 climate-change-dead-canaries scattered all over the globe by now. plutocrats don’t care about canaries or coalminers. Coal industry profits? Yes, that is important. Canaries and coalminers are just collateral damage. Two points – first, to Warmist and Rodger, try using the same dataset as in the second HadCRUT4 graph, but start the trend in 1920 vs. 1940. Picking 1940 as a starting point misses the 30’s peak, and thereby lowers the overall starting point of the trend, which serves to increase the apparent delta with the current peak/trend. Also, to Poltsi’s comment above, we were told back when Antarctic ice was breaking records, that a global sea ice measure was irrelevant and misleading since it showed total ice extent near average. Interesting that now that Antarctic ice is dropping, that the total is suddenly concerning. Has the concensus changed on this point? [Response: Study the sea ice anomaly for the Antarctic. Does it look to you like it’s just “dropping”? Or did it fall off a cliff? Which again is more in line with all other major datasets of Arctic temperature. All of which are reflected and supported by the sea ice extent record over the long term. It would be useful if you had addressed either of my points/questions vs. nitpicking my reference to “average”, by which I meant a relatively flat trend, close to the average for some years. Now in the aftermath of an El Niño, it is certainly declining rapidly. However, it’s worth remembering that the actual decline of Antarctic ice cover is less dramatic when considering that the vast majority of ice is continental, which is the important measure from a climate effect (e.g. Albedo) standpoint. Ditto for NH, where Greenland snow/ice cover is not counted either, in measuring the % decline (or increase for that matter). But again I ask that you or some other commenter address my questions about the graph trend calculations and the change re: relevance of global vs. hemispheric ice extent trends. Really? Who told us that? since it showed total ice extent near average. Really? When did it show that? The only sources that claimed total ice extent was near average were global warming denialist blogs. Needless to say, they were making up fiction. The total has been concerning for a long time, except among global warming denialists of course. 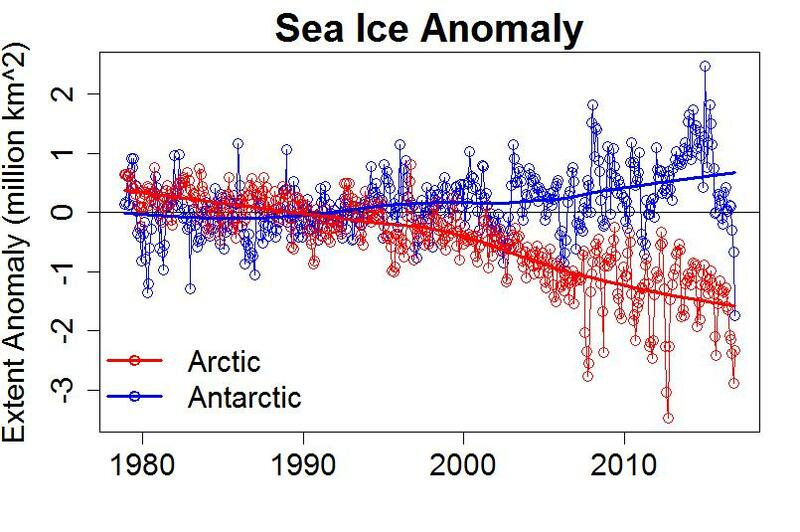 So if the issue is the trend, what is the trend of Antarctic ice (vs. the recent fluctuation)? Why be suddenly worried about the recent Antarctic ‘fall off a cliff’ if that’s a ‘denier trick’ vs. focusing on the long -term positive trend? I think you’re trying to have it both ways. My apologies. When you first presented your “two points,” I assumed you were simply making an incredibly bad fist of offering advice/insight. You gave no reason to believe thay you were expecting a reply!! So let me address the first of your “two points” as you do address it specifically at me (& another). Now, do pay attention Taylor Pohlman. This is the first technical bit. The two graphs are both provided with scales that allows the data they present to be quantified. You will see one of the graphs has six points in excess of +2.0ºC while the other has none. This should be a bit of a worry as the two graphs (sort of) say they present the same data (1940-2013). You will see also that these six points exceeding +2.0ºC on that one graph are all post-AD2000 while the post-AD2000 data on the other graph sits between the value for AD1938 (shown only that one graph) and the value for AD1943. Yet AD1943 is the 14th highest anomaly (not the third highest anomaly) on the other graph (1940-2013) and nine of these higher points are post AD2000. And another technical bit. When comparing +70ºN HadCRUT4 data for periods that are decades apart, the amount of available data can result in a simplistic comparison being wildly wrong. (This is on top of the amount of data varying by differing amounts through the year due to the amount of open water varying year-to-year which presents a further complication.) For periods back to AD1920, the level of data +70ºN HadCRUT4 coverage available is reduced to a tenth the present-day +70ºN HadCRUT4 coverage. These coverage issues makes a comparison with today’s data a delicate job. I would thus be very surprised if carrying out such a comparison would in any way assist in showing the actual “delta with the current peak/trend.” Indeed, if there were an issue with “the apparent delta with the current peak/trend” you would do better to simply mask the pre-AD1940 data rather than fanny about as you suggest. If you would be good enough to look at the title of this post, you will see that it is about the Arctic. Tamino has merely included the bit about the Antarctic to show that even this favorite irrelevant statistic of the denialosphere does not work anymore. Yes, it is the trend that is relevant. However, when you see a huge fluctuation, you might want to pay attention to it as it might be trying to tell you something. To be sure, you will have to see what happens later. Two more things. First, one reason why “global sea ice” is not a particularly relevant statistic, is that when it is summer in one hemisphere, it is winter in the other–and when it is winter at the poles, there is no Sun. Even in a warming world, you expect ice to freeze when Mr. Sun goes bye-bye. Second, the models predict increasing sea ice in the Antarctic at least initially. If we really are getting to the point where sea ice is decreasing even in the Antarctic, then we are really in the soup. For those unclear on the concept: This is a classic ad hominem attack. What CO2 number do we have to keep “under” to keep “under” the famous two degrees cee? I think the climate system is too dynamic and complex to be able to select a CO2 number that keeps us under the 2 degree temp rise. If I had to select a number, I would go with Dr. Michael Mann’s number of 405. It’s a good article, read the whole thing if you have 5 minutes. The problem, of course, is that carbon dioxide levels continue to rise and the rate of rise is not decreasing, in fact, the rate of rise has been steadily increasing for decades. With natural carbon sinks breaking down under the changed conditions, we now have traditional carbon sinks turning off or even becoming new sources of carbon dioxide accumulation in the atmosphere. The real take-away from this situation is that we have to stop the rise of CO2 now and start reducing the level of CO2 in the atmosphere. It makes sense to give up the question about how high can we go safely, and instead ask: how much do we need to lower the number for safety and stability? As smallbluemike points out, keeping under a CO2 level is far from the whole story when setting the requirements to limit global warming. Yet there are analyses that try to present a simplificed gauge of how far we are away from setting the scene for that +2ºC world. This Carbonbrief graphic presents the situation in terms of how many years we have left at present emissions of CO2. The central value for a 50:59 chance of dodging +2ºC is 27 years. (The graphic is 7 months old so I round the 27.8yr value down.) If present emissions would raise CO2 levles at 2.25ppm/year, that would put the magic CO2 threashold at 460ppm. Of course if the idea is to be sure to stay below +2ºC, the number becomes much lower. And do bear in mind, these numbers are dependent on a whole load of assumptions, which is why they aren’t adopted more widely.